Soils are composed of mineral and organic components. Soil texture refers to the relative amounts of three particle sizes: sand (the largest), silt, and clay (the smallest). The diagram below shows the relative sizes of these particles. 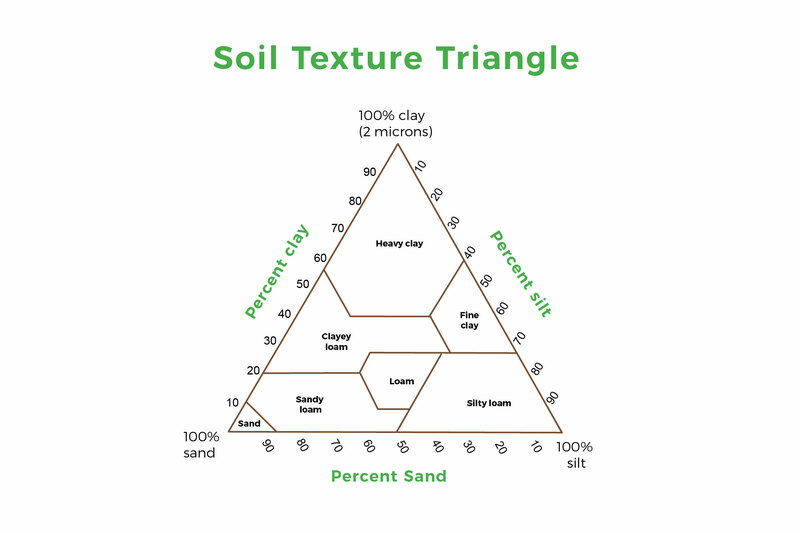 The soil texture triangle shows the proportions of each particle size and the name of the resulting soil texture. Texture is a key soil property and influences water drainage, nutrient levels and susceptibility to erosion. Loam soils are ideal for growing food as they have a good balance of smaller and larger particles, which means they have space between for air and water (most plant roots need both). Water does drain in loam soils, but not too quickly, so they do not get too wet or too dry, and hold nutrients well. Sandy soils tend to be drier and low in nutrients as water drains away quickly washing nutrients away quickly. The very fine particles in clay soils make it difficult for water to penetrate so they can become waterlogged. When clay soils dry out they become very hard which makes it difficult for plant roots to penetrate them, and water tends to run off the surface. Clay soils tend to be rich in nutrients because the many tiny particles hold more. 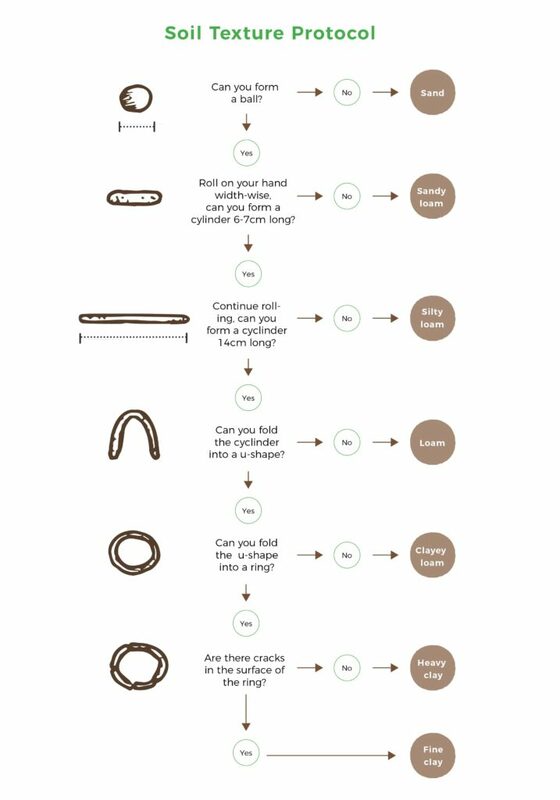 Use this guide to determine the soil texture in your Experiment plot, there is also a printable guide that you can take outside with you. Only one sample is needed and it should be taken from the corner of your experiment plot, away from where you have planted. Most plots should have space on the south side (or north if you are in the southern hemisphere) for you to dig. However, if you need to, use the area just outside of the plots to avoid disturbing the plants. Dig a hole to 15 cm depth using your trowel – use your ruler or measuring tape to measure the correct depth. At 15 cm from the surface push the trowel into the side of the hole to take a sample at this depth. Once you have collected your sample, break up the soil with a spoon or your fingers, and remove any stones, gravel, and pieces of large organic matter like leaves or roots. It is best to wear gardening gloves for this part to protect your hands. 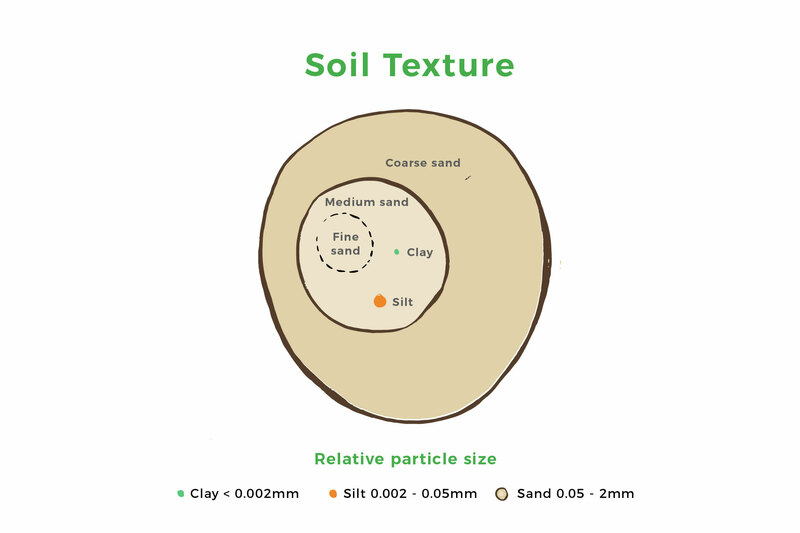 Watch our short video outlining the process of assessing your soil texture. Manipulating soil with your hands and observing what shapes you can form can give an estimate of soil texture. To begin the hand texturing test, take a handful of soil and add water until the soil begins to stick together without sticking to your hand. Knead the moist soil between your fingers and palm. Now follow the flowchart below to determine your soil texture.